This is one good-looking mess of a story. Seriously, as I discussed in my podcast post (why not listen to it and subscribe via iTunes?) this is confusing as hell despite having great art. Let's look at just where things go wrong after the break--and yes, I try to be funny again like in some of my posts. Here is how confusing things are, I read the plot description on Wikipedia and still can't make heads or tails of just what the hell happened in this book. You may be saying, "David, if you didn't care for this comic that much why did you buy it?" Well, mainly because I'm an idiot who had one day had money to blow thanks to some holiday or birthday--and I didn't realize that after college I'd need to actually spend money on food and housing--and I saw this big book for sale written by Brian Azzarello with art by Jim Lee. I thought to myself, "Wow, I just read some of that 100 Bullets by Azzarello and Jim Lee makes some great art, this must be one great book! Plus, it's on sale and at this point in my life I have the self-control and brain capacity of a bowl of tapioca so I think I shall buy it!" This bad-guy wears sunglasses at night. I will resist making an obvious 80s music joke. Just what is the plot, you ask? I dunno, it starts out strong with Superman talking with a priest who is having a crisis of faith due to his having cancer, there is a discussion about how a million people vanished from the planet--including Superman's wife, The Justice League pops up, good times are had by the reader. Then Superman goes into a nation and takes everyone's guns to make a point, but they just fight with rocks to show even he can't stop mankind's innate bloodlust, which is kind of cool. Then it gets weird when he goes into a mini world he created in the phantom zone populated by real people as well as robots. Yeah, you've lost me. 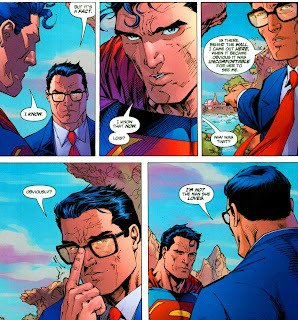 Superman argues with a robotic Clark Kent he created. Okay? 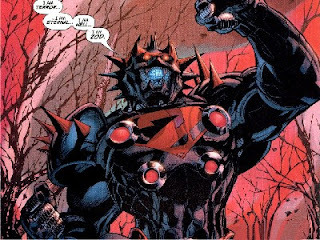 Did I mention there is also a weird organization we never really learn much about, that the priest becomes a killing machine to fight another monster for no apparent reason, and what was later declared to be an alternate-universe version of General Zod shows up? Yeah, this is some weird stuff. The one saving grace? It looks damn good--like really, really nice. 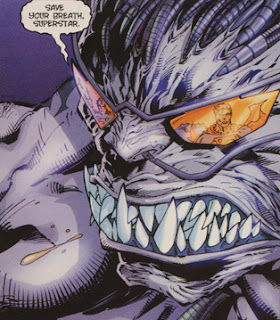 Whether it is people talking, fighting, or flying around, Jim Lee turns in some amazing pencils to compliment the insanity that Brian Azzarello came up with for his script through what I can only assume involved smoking a lot of hallucinogenic materials. Although in later comics DC said you weren't the Zod. Sorry, dude. This would make a great art-book of random images, but as an actual story it is just a confusing mess with some good individual moments, but is overall confusing as hell. I sort of blew my money getting an Absolute edition but in a way I got the book in the best possible format because it emphasized the best part of this arc--the art. Honestly though, you could just pick up the two volumes this is collected over and call it a day if you are a huge Jim Lee fan or a Superman completest. Otherwise I see little reason you need to read this. Superman: For Tomorrow, Vol. 1 for the first part. 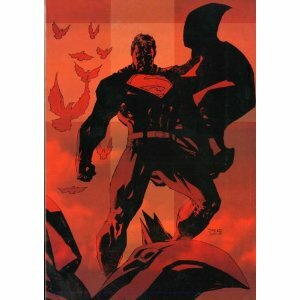 Superman: For Tomorrow, Vol. 2 for the second part. Absolute Superman: For Tomorrow if you like wasting money on mediocre comics.